Managing the effects of dementia can be difficult for everyone involved, including children. Although your first reaction may be to avoid telling your kid about an elderly loved one’s diagnosis, it is important for the child to understand what is going on. Here are some tips to help you speak about dementia with your children in a calm and clear way. Children need to understand there is no cure for dementia, but there are steps that can be taken to slow the symptoms of the condition. When speaking about dementia with your child, tell the whole truth. Being open and honest and asking your child questions can help you gauge his or her current level of understanding. When you are honest, your child will trust you more and look to you for guidance in the future. If your senior loved one has been diagnosed with a serious condition and needs help with tasks like meal prep, transportation, bathing, and grooming, reach out to Home Care Assistance, a leading provider of elderly care Green Valley, AZ, families can trust. We also offer comprehensive care for seniors with dementia, Alzheimer’s, and Parkinson’s. 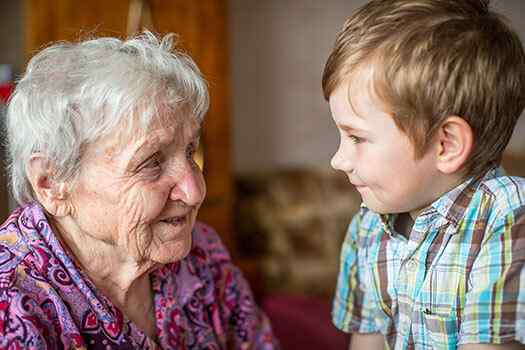 The objective of dementia-related conversation is to let your children get a better understanding of the disease. When your child responds negatively, you can use this as a teaching point. Let him or her know what is appropriate and inappropriate to say to your loved one. You can also teach your children ways to control these negative emotions. There are certain symptoms all seniors with dementia have in common, such as confusion and agitation. When speaking with your children about dementia, prepare them for the bad episodes that could take place. Detail the personality changes your loved one could experience, in addition to the memory issues. Keeping your child informed can reduce the amount of fear he or she feels when around your loved one. Caring for older adults with dementia can be a challenging task. Families who find it difficult to care for their aging loved ones without assistance can benefit greatly from professional respite care. Green Valley, AZ, family caregivers who need a break from their caregiving duties can turn to Home Care Assistance. Using our proprietary Balanced Care Method, our respite caregivers can encourage your loved one to eat well, exercise regularly, get plenty of mental and social stimulation, and focus on other lifestyle factors that promote longevity. Do not make the discussion all about medical facts. Brainstorm about fun activities that seniors and their grandchildren can do together. Explain to your child how these activities can stimulate your loved one’s brain and help him or her control the dementia. Explain to your children that your loved one may act out negatively, but it doesn’t affect the way he or she truly feels. For example, if your loved one doesn’t know who his or her grandchildren are and yells at them or tells them to leave, it is due to the dementia. Children tend to be more empathetic to seniors with dementia when they know it’s the fault of the condition and not the person. Dementia is a serious health concern. If your elderly loved one is living with a serious medical condition and needs help managing the tasks of daily living, reach out to Home Care Assistance, a Green Valley home care agency you can trust. Our caregivers are available 24/7, there are no hidden fees in our contracts, and we offer a 100% satisfaction guarantee on all of our in-home care services. To create a customized in-home care plan for your aging loved one, give us a call at 520-625-2050 today.